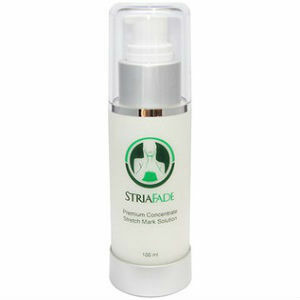 This is a product review for Premium Naturals StriaFade Premium Concentrate Stretch Mark Solution. According to the manufacturer, StriaFade has an extraordinary blend of ingredients that prevent and repair striae in both women and men. It reduces stretch mark appearance whether the stretch marks result from body building, pregnancy, or weight gain. Read further to know more about StriaFade and its suitability. Palmitoyl Tripeptide-5- boosts collagen, reduces wrinkles, prevents stretch marks, and reduces stretch mark appearance. Pseudoalteromonas Ferment- reduces stretch mark appearance by increasing the production of collagen. Shea Butter- has anti-inflammatory properties. Shea butter moisturizes your skin and contributes to cell repair. Onion Bulb- reduces stretch marks. Safflower oil- prevents skin dryness. Chamomile Extract- has anti-inflammatory and antioxidant properties. Allantoin- smoothes and soothes your skin. It also protects your skin and promotes the proliferation of cells. Marine Collagen Hydrolysate- skin moisturizer. Glycerin- prevents dryness by holding moisture against your skin. Sodium PCA- prevents skin dryness. Retinol Molecular Film- fights aging and enhances cutaneous absorption. Idebenone- tightens and smoothes your skin. Alpha Tocopherol- promotes skin healing. Tea tree (melaleuca) oil- fights bacteria and fungi. Use StriaFade for external application only. Clean and dry the targeted area and apply a substantial amount of the cream. Apply two times daily for best results. One bottle (100 ml) normally lasts for about 4 to 6 weeks. Nursing women and pregnant mother should always consult a medical professional before using this product. Stop use and consult a doctor in case of severe irritation. While some people may realize results within one month, others may realize full results after three to six months. Although most people can use this product without negative effects, there is a likelihood of experiencing allergic reactions depending on your skin type. To minimize the chances of a reaction, users should begin by applying the product in small inconspicuous areas. In case of allergic reactions, stop use and report immediately. You can purchase StriaFade directly from the manufacturer for $49. This product is also available at discounted prices. Two bottles cost $88 while three bottles plus one free bottle cost $147. Four bottles plus two free bottles will cost you $196. There are no shipping charges for the latter package. A satisfaction guarantee (100%) shows the manufacturer’s confidence in this product. The risk-free guarantee is valid for 30 days. Users who are unhappy with the product can return it for a full refund. There were also many positive customer reviews. Based on our research, this product has the ideal formulation for preventing and repairing stretch marks. Its advantages include price discounts and a satisfaction guarantee. However, there is a possibility of experiencing unwanted side effects. Furthermore, this product is relatively expensive and it may take a long duration before you realize the expected results. As a result, it might be worth it to shop around to try and find the perfect stretch mark product. David Carney	reviewed StriaFade	on August 15th	 and gave it a rating of 3.